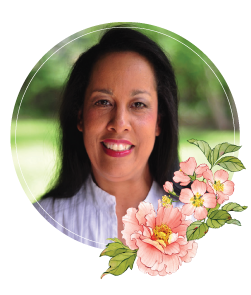 Hi sweet friends – what comes once a month and has me antsy all month long? Another Die of the Month, that’s what. 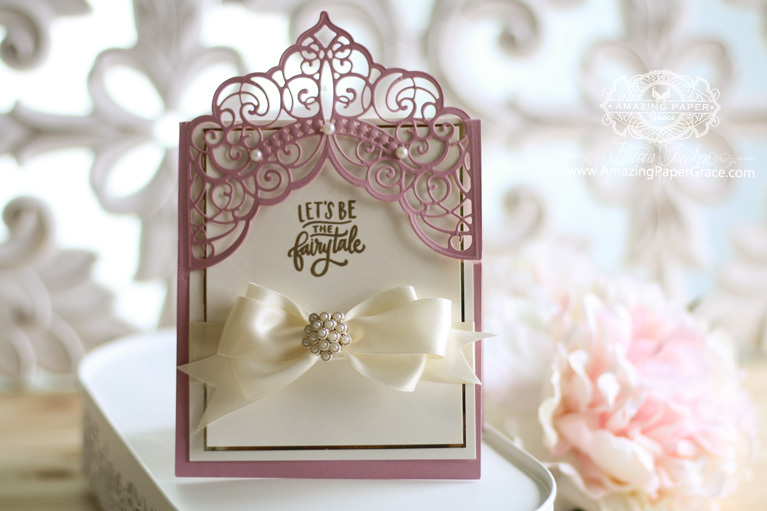 This month I am sharing – a die called Lace Finery Slip In Card, it’s the Amazing Paper Grace January 2019 Die of the Month. (Note: Thank you friends if you have answered my Questionnaire this week – the contact forms are rolling in and what you are telling me is music to my ears! If you have not visited my blog lately, I have a special request at the end of my post). I kind of found myself looking for a different kind of challenge that would allow me to design many things with one die. Many of you had written asking me to release some premier dies on a slow schedule so they could be purchased one by one. Well, that’s the Die of the Month program. Do not worry if it is not in your budget – that happens. I still have other dies and collections – but this one allows you to get multifunctional dies that are classic and should be in style for some time to come. I get this question all the time, so let me say they become available one at a time and when they are sold – they are not reordered. 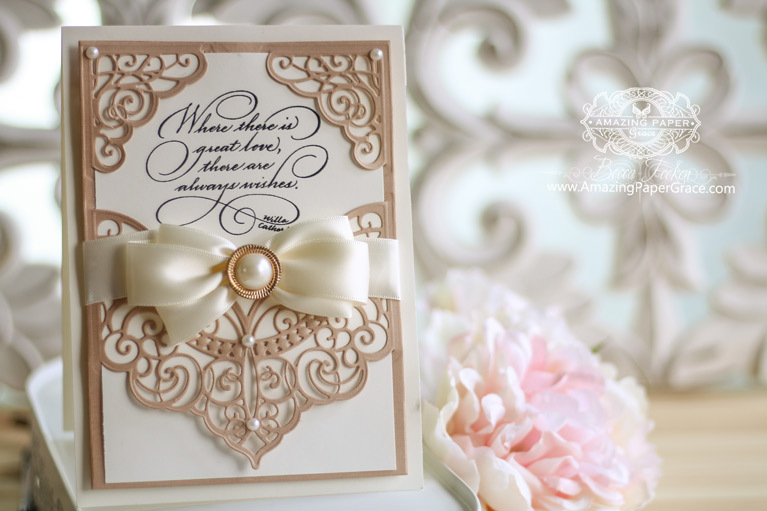 The January “Lace Finery” Die is one of my favorites. I can’t tell you how fun it was to put this together and dream of what you would do with it. Believe me, I don’t have to go far to get to second and third favorite, but this one — this one is quintessentially me! I wanted a die that you could cut apart and use the pieces — um, or not. If you want nothing more than to have four tuck in corners for a frame to put a pretty picture in or sentiment – then this is your die. If the princess look is right for the occasion then, this one can be configured that way. I even combined two motifs to make one delicate card front motif. Many years ago I did a questionnaire at the end of the year that I asked you to submit your answers through my contact form. I’m doing that again because it gave me so much insight as to why you stop here. I would be so honored to hear your thoughts – they will help me set my course for 2019. Please submit through the contact form at the top right of the blog. Answer all or answer any or just send a private note – here’s what I want to know…. How long have you been a reader? What do you miss most that I’ve moved away from? Other than videos, what am I not doing that you would like to see me do? Do you have other crafts do you love? Thank you for being there for me throughout the years. I’m bowled over and touched by everyone who has responded to my request. It may take me some time but I’ll read them. So tickled to see so many familiar names. I can’t wait to know more of you!! Good morning Becca, congratulations on another fabulous die!!! It’s so yummy? Have a good one !!! This is a gorgeous die set! You never disappoint! I’m very drawn to the ivory, pink and gold color scheme so I can never see it too often. Love your tutorial for the January die and WOW! Excited and anxiously waiting for it to arrive. Will have to watch the video again when it gets here to make something for my Sis’ birthday next month. She loves all the handmade cards I make and send to her. Happy New Year and keep up the fantastic job you are doing Becca!! Beautiful cards! This may be the one to make me sign up for the monthly’s!! Good Morning sweet Becca, this is such a unique card. It truly represents your love for John and that you are willing to share that with us shows us all that we too can share with your magic touch. This die is both romantic and a show of great love. I truly am in awe of it and am looking forward to receiving mine. WOW, absolutely exquisite! Your projects made with this amazing die are so, so beautiful. I am so envious of those who are able to get this. 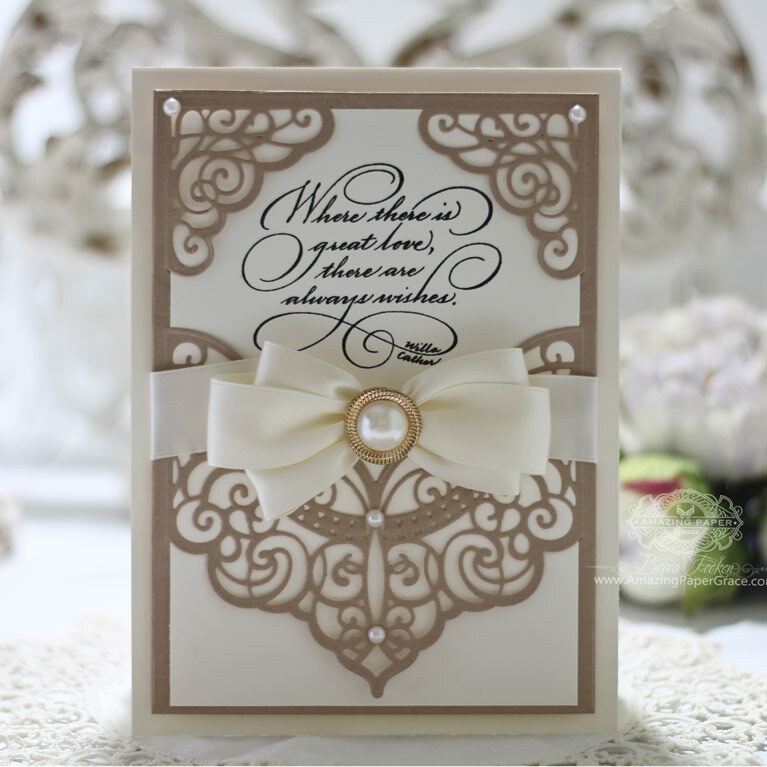 I wish Spellbinders would make it more easily affordable and available to the UK! Becca, I just love everything that you design. Your cards were a huge inspiration in the direction that I took with my paper crafting, when I first began. I must’ve watched just about every one of your youtube tutorials! Thank you so much for sharing your beautiful talent with the world! Your cards are so elegant! How long have you been a reader? 3/4 years maybe more, I’ll check out the dies you’ve used in the past and see where I started following. 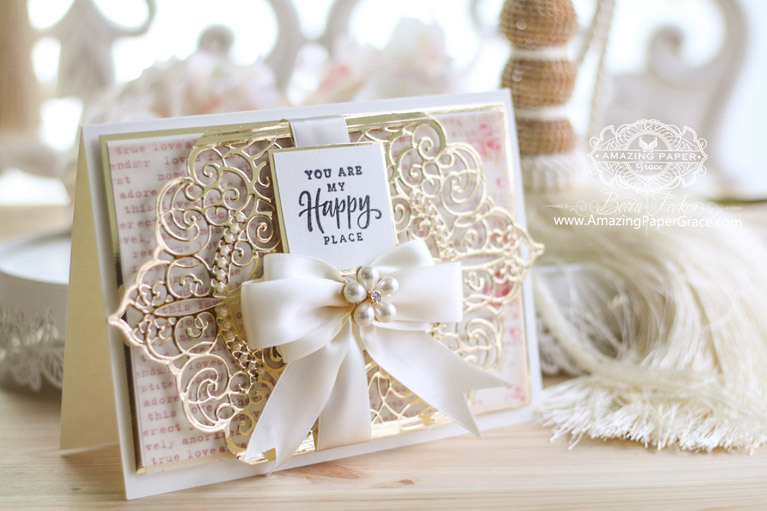 I’ve been a fan for several years ever since I saw your dies on the Spellbinders site. I always like how elegant your cards are and it gives me inspiration in my own projects. I own a Grand Caliber as well as a Crafter’s Companion Gemini. I die cut and punch the most. Mostly for cards as I don’t have too much right now to scrapbook. I would really like to see more of this site as a one stop shopping (buy dies here, see videos, blog, etc).